I hope you're having a fantastic week. Can you believe it's already December? It's time to open your first flap on whatever advent calendar you are using this year. I'm personally sticking to my absolute favourite; a standard galaxy chocolate advent calendar, but I know there will be so many people with much more fun and exciting calendars than me this year. As a chocoholic, I don't mind! I have absolutely no idea how Blogmas is going to go for me, with dissertation deadlines and my mental health being up and down for the past few months, but I'm going to give it my best shot again and hope to succeed. Fingers are crossed! There are a few exciting posts coming up in the next month which I CANNOT wait to share with you. I should really start planning them to be honest, otherwise they won't be going up! But I know you're going to absolutely love them. I'm hoping December will be filled with a heck load of positivity and happiness with all of the motivation I can possibly bring. If there is anything specific you would like to see from me throughout December, or even in the New Year I would absolutely love to hear your input! So, it's the first; what is everyone doing today? Or what are you doing this weekend? Sadly I'm spending my first day of December working, but the weekend will be spent banging out the Christmas Hits while sorting out the Christmas decorations and the tree on Sunday (A post to come soon all about it). One more thing; Christmas baking this year, yay or nay? Let me know! 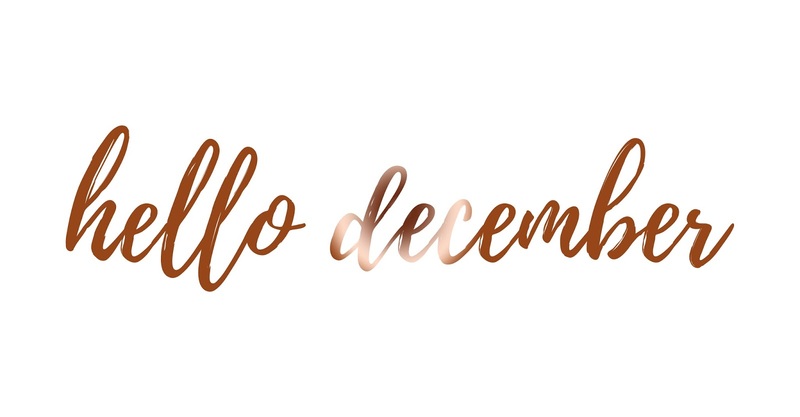 Have a happy first day of December, and of course Friday!